Here's the full size image of the schematic. That's the LED I was looking at. There is another one: http://cgi.ebay.com.au/ws/eBayISAPI.dll?ViewItem&item=280516196821 but I don't know the brightness. BTW Don't forget to add the price of switch caps for the E-switch tactile switches, which are only available from Digikey AFAIK (part 401-1152-ND), another 48.12 USD for 289. This is why I stopped working on a design using E-switch, it's still a lot to pay for switches/caps and they wouldn't be illuminated. TK's DIY approach is better if you want to make it cheaply, and have illuminated buttons. The Livid pads aren't ideal, they're quite tall compared to the ones used on monome, making the overall height of the box at least 45mm, but the 0.8125" spacing keeps things smaller than the Sparkfun button pads, which means saving a bit on PCBs, panels, etc. It's still going to cost a lot just to make one set of prototype PCBs, but in a mini bulk order (20 orders) it should work out at under 100 USD for all the PCBs required, including driver boards... I'm guessing though... my mini bulk order of SEQ PCBs came to 32 AUD each, and this is over four times the board area.... but with a design using 3 pcs 16x4+4, 1 pcs 16x4+4+16, 5 pcs driver boards, that might bring the board cost down. My plan with the tactile switches would be to do similar to TK's DIY approach, but with laser cut acrylic caps on top of the silicon sheet. They could be engraved/infilled, and even swapped around if I decide to change button functions. The specific switches I'm looking at could also be used 'non-illuminated', with the actuators and LEDs sticking through simple drilled holes in a panel. Well i think this i probably more a question of personal preference than of costs. A device featuring 256 + x buttons with a nice case and professionally made FP wont be a bargain in any case. as the livid pads. They still have the downside of being clicky and not feeling very good IMO. As TK mentioned before its very likely that there are coming up different people with different designs out of different preferences and i think thatÂ´s a good thing. Got my livid buttons in and here is some info: Hole size 0.215" (snug on the gauge pin). The conductive part is VERY thin (paper thin) but the action of the button is awesome. 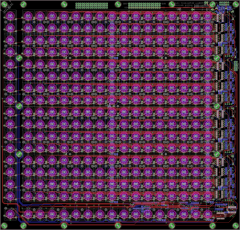 Depth of hole: 0.508"
I've done the layout according to the schematic... the row of extra buttons at the bottom was pretty tricky, but I guess I complicated it by putting ludicrous amounts of mount holes (much like my MB-SEQ PCB) to give full flexibility in construction, i.e. mounted above to aluminium front panel, mounted below to base like sammichSID, plenty of holes for mounting a "spacer" like the Livid ones, or securing the rubber pads separately to the mounts, etc. So as I see it, the most optimal solution is one PCB with 4x16 buttons + 4 on the left (i.e. just like the schematic). That layout also supports the extra 1x16 row + shift button, as either a separate PCB or as part of a 4x16 PCB. So in theory, if this went to a mini bulk order stage, you could structure it as two different PCBs, either with the extra 1x16 row attached or separate. However, this 4x16 PCB should work as an original BLM 4x16 extension to MB-SEQ, a much more useful "reuse" than trying to be all things to everybody. Would the original BLM 4x16 extension to MB-SEQ benefit from the extra row of buttons at the bottom? Or would people prefer just the 4x16 plus extra 4 buttons (aka. Track Group select)? If the latter is true, then maybe it is worth putting another J3/J4 connector on the left so you could connect another BLM scalar driver board for the extra buttons. Wilba, I assume you made it like your mb-seq layout so the same tact switches from that build can be used for this new layout? And if your not using e-switches, what will you be using for yuor own build? Looking more at the layout, where are the led holes located? Are they in the center of the switches? If so wouldn't this restrict the possible options? Can you please clarify. I'd have to assume the cheapest solution to build this thing would be to use the e-switches/panasonic light touches with no caps and have the led hole placed just above the switch hole like in your MB-SEQ control surface pcb. That way you can drill your own panel switch and led holes. If I did it this way I would only be looking at $36 for switches, maybe $10-$15 for leds, maybe $15-$20 in resistors, diodes and shift registers plus the PCBs. So possibly only $170+shipping to make it without a custom case and panel but still have good functionality. From looking at the picture of your layout we just need to get some DIN and DOUT boards connected to this thing right? Or are you also planning driver boards? And just to clarify for myself, this is primarily designed as an extension to MB-SEQ correct? So would you chain from the J2 port of your control surface pcb to the extra DIN and DOUT modules/driver boards needed then to the BLM? Wilbaâ€™s PCB is designed exclusively for the button pads available from Livid. 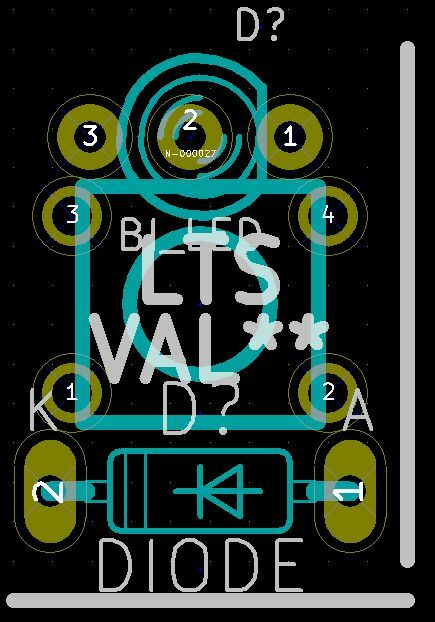 I will design a PCB as you suggest, with 3mm LEDs, 6mm tacts (probably Panasonic LTS). LED will be â€˜sittingâ€™ on the switch base, as close as possible to the actuator. The actuator will be just tall enough to use a flat DIY button cap for illuminated button goodness, or it should be possible to drill your own separate LED and switch holes. Iâ€™ve attached my draft arrangement of switch/LED/diode. Iâ€™m waiting for TKâ€™s ok on my alternate schematic. The BLM16x16 requires its own Core8, and 5x BLM_Scalar modules (analogous to DIN/DOUT). The BLM is connected to SEQ via midi. As I said earlier, I'm just playing around with a layout using the Livid buttons, since they look pretty nice and I've been told they have good action. Other switch/LED/cap combos won't give much of a saving, given that PCBs, panel, LEDs, etc. will cost the same with any switch/LED/cap combo. So it comes down to personal preference, and the total price on one of these things is going to be huge. You would be better off trying to save on the panels and case. Example: To get a 15"x15" 3mm aluminium panel from Front Panel Express with 289 holes is 246.48 USD. I haven't even added reverse side threaded blind holes yet! Cha-ching! Ponoko can cut a similar size acrylic panel (15"x15"x3mm) for much less, but then you will probably need double thickness to stop it being bendy in the middle, or some spacers, it's not a direct substitution for aluminium panel, and you couldn't mount PCBs to it like you can with aluminium. Maybe a complete case made out of 5.5mm bamboo sheets would be possible, the top panel alone would be cheaper than FPE, but then it might need a chunkier case. And only one colour etc etc. And only if they're not sold out. well last one was sold for 1800$, shipping not included. VAT not included. would have been 2200 to have it here on my desk. Thanks for clearing that up for me Wilba. If I went with livid pads do you think I also need to get the spacers that they sell as well to hold the pads in place? Or you think the switch and panel would hold the pads in place? I assume that's what you meant by adding regular spacers because the pads are attached permanently to the sheet and putting regular spacers strategically would support the sheets pretty good. The spacers I was referring to are the threaded kind that separate PCB from panels or from a case base. Livid pads would need 10mm spacers between the PCB and the bottom of a 3mm panel. They would be placed where there are big holes in the Livid pads, or just make more big holes by hand, and not expected to hold the Livid pads to the PCB. I'm assuming we could find another method of holding the Livid pads to the PCB... maybe just screws/nuts through holes in the button pad/PCB not being used for attaching to the top panel. Hi there, the spacer layer used by livid(check the image) is a must, otherwise the pads tend to move sideways when pressing them. A 16x16 + x + y + shift spacer shouldn't be too hard to CNC/laser cut out of plastic or wood? Question: do the protruding LEDs help to align the rubber sheets? Wilba, or other PCB masters: Looking at your layout here, I see that you've got 2 separate boards (4x16, 1x16), with pads right at the edges to connect the relevant traces. Is it feasible to get this manufactured in a single job? Is V-score or Tab routing best for this situation? Wilba, or other PCB masters: Looking at your layout here, I see that you've got 2 separate boards (4x16, 1x16), with pads right at the edges to connect the relevant traces. Is it feasible to get this manufactured in a single job? If you can get a fab to make one huge PCB, maybe it's feasible, but not possible with the fab I use (Gold Phoenix), at least with their current prototype deals. Is V-score or Tab routing best for this situation? Neither. If you were going to split your full BLM into sections, you would want properly routed edges. This is what you would get anyway when you get boards made. V-scoring and tab routing is mostly for arraying multiple PCBs onto one panel so they can be assembled together, then split after assembly. V-scoring will leave the edges rough, and they might not be a perfect alignment where they join. Maybe it's possible to setup one PCB (4x16 + extra row attached), get four made, and chop off the extra row... perhaps with a V-score between the 4x16 and the extra row. You end up paying for three extra rows you don't need, but that might be cheaper than the extra setup fee. Is it ok to distribute the transistors around the boardâ€¦. Ie. have them far away from the shift registors? I know I must maintain the path of the signal chain between J1/J2 as mentioned in TKâ€™s BLM_Scalar schematic. Also, is it safe to leave unconnected the unused pins on the shift registers for the extra row/column BLM_Scalar? Well, here's a first pass at it. Need to give more space for the extra row so it can be broken off, and add all the mounting holes. mbhp_blm_map.pdf the mapping between BLM_SCALAR and Buttons/Duo-LEDs. and the BLM module looks very great ! thanks to the schematics provided here it seems ok.